The blue-chip Dow Jones Industrial Average ($INDU) heads into the final unofficial week of summer down about 2.5% on the year and traders face some daunting challenges in the days ahead. It's bad enough that a steady stream of disappointing economic data has been pressuring stocks throughout August, but now some of the most important readings on the health of the recovery are slated to come out this week. Even worse, the Dow historically posts losses in the weeks before and after the Labor Day holiday. 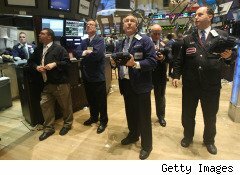 Tuesday will bring a particularly heavy dose of potentially market-moving news. The S&P Case-Shiller Home Price Index is due out and, with last week's reports that new and existing home sales plunged to record lows, the outlook does not look bright. The market will also have to digest readings on consumer confidence, manufacturing and the release of the minutes from the Federal Reserve's most recent meeting. And that's just what on tap for Tuesday. The following days include everything from more manufacturing figures to productivity data to factory orders -- culminating with the mother of all economic releases, the unemployment report, on Friday. All of this news will come just in time for the Labor Day weekend, a historically unkind time for stocks. The folks at Bespoke Investment Group, an investment research and money management firm, crunched 20-years of data and found that the Dow doesn't like the end of summer anymore than anyone else does. On average, the Dow has lost 0.54% in the five days before Labor Day over the last 20 years, the firm found. That would equate to a decline of about 55 points on the blue-chip index this week, leaving it below 10,100. When investors return from the holiday, the results historically have been equally lackluster. 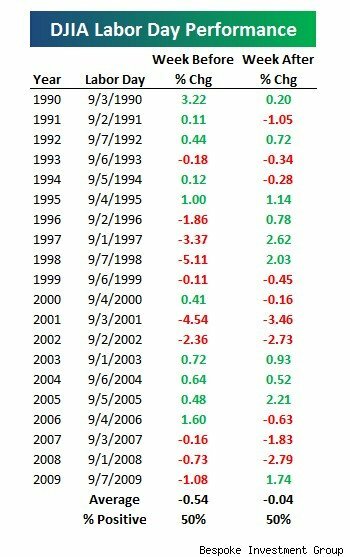 In the four-day trading week following Labor Day weekend, the Dow has averaged declines of 0.04% in the past 20 years. As the researchers at Bespoke put it, "Isn't the end of summer already depressing enough?" For a historical look at the Dow's action before and after the Labor Day weekend, see the chart below.